Last Monday the Climate Change Conference in Paris has started. One of the biggest causes of climate Change is deforestation. The official numbers of CO2 emission varies between 12% en 20%. Wat is deforestation and what are the consequences? Watch this short dutch video. 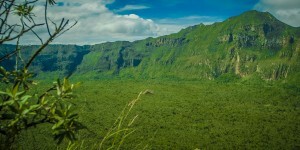 In South West Kenya you can find Mau Mountains, which contains 25% of Kenyas forest areas. It is one of the biggest compact forest areas in East Africa and millions of Kenyans depend on it for their watersupply. However years of illegal colonisation have destroyed big parts of the woods. NRC journal of Friday 27 November quotes farmer Alfred Soi: “We have always been warned by the tribal elders not to destroy the wood because it would lead to destruction of life. Why do politicians nowadays forget that? I would like to strike them with a curse”. Years of misrule, mondial as well as local have contributed to icecap melting of Mount Kenya and destruction of the woods which once were beautiful. The problem in the West is that we only know about Climate Change through information. We do not feel it. We do not experience it. As a result only 7000 people marched last Sunday in the Climate March Amsterdam. Reading the article above suddenly the consequences come closer. These people are living close to nature and they see, hear and feel it every day.